The POP3 server in Mailtraq is one of the best available. POP3 is the most common method of receiving mail - messages are moved from the 'mailbox' in Mailtraq to the email client. The email client can be anything from Outlook to Thunderbird and a BlackBerry or Android phone to Mac OS-Mail. The POP3 server provided by Mailtraq allows your email clients to collect messages that have arrived in Mailtraq from the Internet - from other servers - or from your local network and other authorized users. Mailtraq's POP3 server installs automatically with a safe default configuration. See POP3 server video. The Mailtraq POP3 server can be used for collecting mail from external mailboxes out on the Internet, and routing the mail to the correct mailboxes within Mailtraq. Although the POP3 server protocol was not designed to enable mail to be routed after being downloaded Mailtraq can use message header fields to send messages to the intended recipients. Some POP3 accounts provide custom mechanisms which attempt to overcome this problem, usually by placing the address of the intended recipient in a non-standard header in the message. 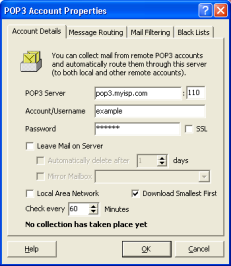 One advantage of using the POP3 server to collect mail is that the headers of any messages waiting on the remote POP3 server can be retrieved without downloading the whole message. Mailtraq leverages this capability by providing filters which act on the headers and on the overall message size so that mail can be screened in advance of retrieval. If filtered mail is left on the remote POP3 server instead of being downloaded, it can still be retrieved at a later date by altering the properties of the message preview entry in the console. DBL (DNS Black Lists) servers can also be configured, which allows Mailtraq to use public black lists to determine whether or not a client should be allowed to send messages to Mailtraq.